Want to give new life to that old chair? 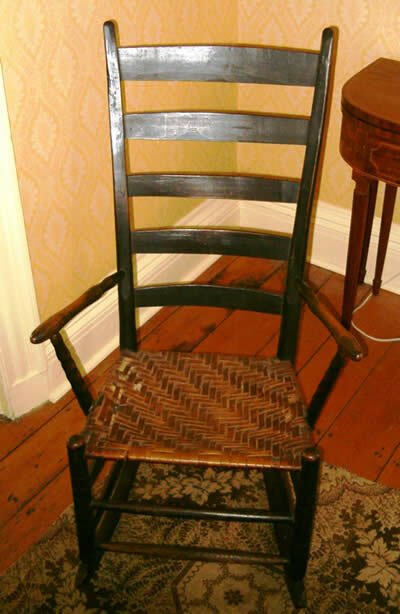 Come to the St Lawrence County Historical Association at the Silas Wright House for a few evenings and learn how to weave a splint seat! The St Lawrence County Historical Association is offering a low cost workshop on two consecutive Wednesday evenings, March 28 and April 4, from 7-9 pm. Carl Stickney, instructor for the workshop, has decades of experience in chair caning and splint seat repair. More importantly, he is a patient instructor in a craft that is both useful and enjoyable. Participants in the workshop should bring a chair with the old seat removed. The workshop fee is $48 for historical association members and $58 for nonmembers. Class size is limited, so early registration is strongly encouraged. The splint material for an average size chair is included in the cost of the workshop, but additional supplies to bring from home include: scissors, an awl, a paring knife, a few clothespins, a rag, and a small water container. The Splint Seat Workshop will be held in the St Lawrence County Historical Association at the Silas Wright House, 3 East Main St., Canton. To register for the workshop send your name, address, phone number, email and nonrefundable payment to the St Lawrence County Historical Association, PO Box 8, Canton, NY 13617. For more information, call the SLCHA at 315-386-8133 or e-mail. Registration is limited and is taken on a first-come, first-serve basis. Parking is available in back of the SLCHA, next to the museum’s main entrance.